I love using facial masks as a part of my beauty routine because they refresh my skin after days of putting my face through the ringer with makeup and other harmful undertakings. Sometimes I find it is best to make my own homemade natural masks, but when I'm not feeling up to making my own potions, I jump to one that's already made. 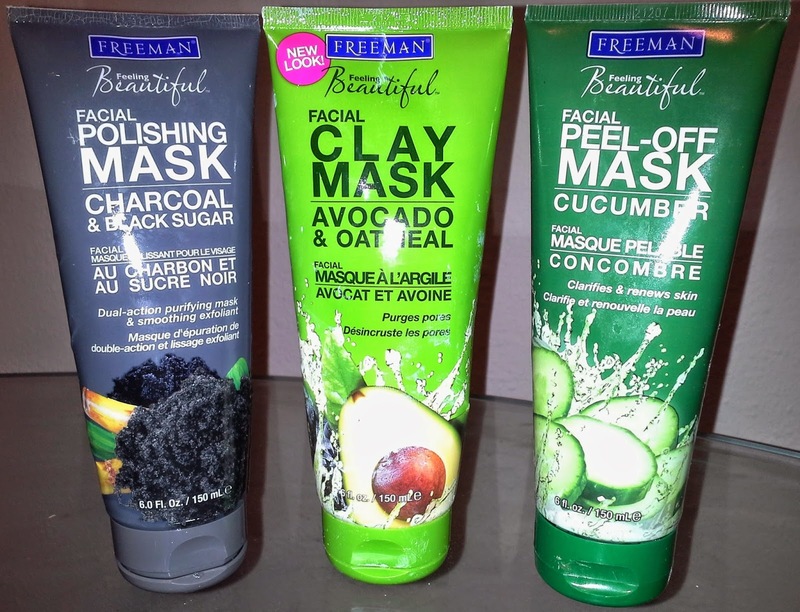 These are the three masks that I gravitate toward on a biweekly basis: Facial Polishing Mask with Charcoal and Black Sugar, Clay Mask with Avocado and Oatmeal and Facial Peel-Off Mask with Cucumber. All three contain very beneficial ingredients that help different aspects of the skin. This one is my favorite of the three. I find it is not too drying and makes my face feel very refreshed. Oatmeal is an ingredient that I typically include in my homemade masks because of its range of benefits for the skin. Avocado also has many great benefits to the complexion, such as moisturizing and brightening the skin. It's very easy to apply and feels incredible! After I've washed my face, I use my fingers or a foundation brush to rub it in. I leave it on for about 10 minutes, rinse it off and follow up with a moisturizer. This one is my second favorite of the three. I got it because I find charcoal masks to be very interesting. Who knew charcoal could be so beneficial for the skin? It also peaked my interest because it contains something called "black sugar". For this mask, I apply it using my fingers and leave it on for 5 to 10 minutes. After it has settled, I use it as an exfoliant. Before rinsing it off, I rub it, like I would any exfoliant and follow up with a moisturizer. The whole process leaves the skin very tingly, which can only mean that the minerals are at work. Charcoal is great at unclogging pores and the black sugar also helps remove any dirt. During the exfoliation process, the black sugar, combined with the charcoal warms the skin, which helps release harmful toxins from the pores. Using this mask too often can cause dryness, which is why I also use plenty of moisturizer afterwards. I use this one the least of the three. It is not too drying and I find that peel-off masks are so much fun to use! This one gives my face a nice tingly feeling that isn't too intense. It is less harsh than the other two and the cucumber ingredient is very beneficial for clarifying the complexion. This mask also contains aloe vera, which gives an explanation for the fresh sensation it gives during and after application. I use my fingers to spread it all over and leave it on for about 10 to 15 minutes. After that, I peel it off and whatever doesn't peel off, I simply rinse off. I find the longer I let it dry, the easier it will be to peel off. I highly recommend these masks because they contain some awesome ingredients and they're very affordable! You can purchase them at CVS, Walgreens, Ulta and your local grocery store for around 3.99$.